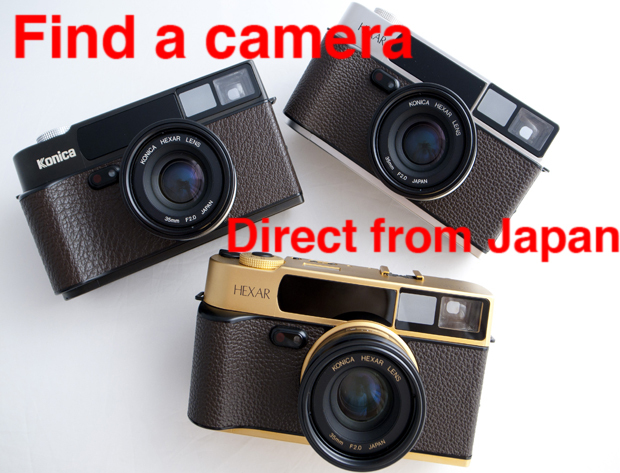 I pride myself on being able to get hold of the best classic cameras in Japan. Some of it you’ll find here on the website but I’m out pretty much every day finding and buying new stuff for my customers. Japan has the best quality and selection of used camera equipment in the world. Added to this are the items that can only be found in Japan and you have a perfect combination. I scour the stores, auctions, internet and private sales to find the best for my customers. I only charge the price the item costs me plus a service charge and shipping. There are no hidden charges, overcharges or rip-offs. I pride myself on offering a special and high quality camera sourcing service. My service is not like e-bay and I work very hard to make sure that you get the best camera for you, so please don’t ask me to comment on e-bay auctions, as I will not. So, if you have a particular camera you are looking for let me know using the form below. Give me, please, the name of the camera, some idea of your budget and any other details you feel I need to know. The more information that you can give me the better, I get a lot of requests and would like to be able to offer you the best possible service. Please don’t just write ‘Leica $800’ as that is not at all helpful to me. Please be patient, I answer every single request, but due to the volume I receive it may take me a day or two to get back to you. Please note, I don’t source modern digital cameras, unless there is an exception for a rare or unusual/Japan only item. Canon QL17 – Reason: Too hard to find for fair prices in good quality. My fees make them too expensive. Ricoh GR1s/v/21 – Reason: No longer repairable, too many in bad condition. I cannot guarantee them. Also, I source cameras to order, so it really helps me a lot with your request if you give me as much information as possible and a specific camera. The more I know the more I can do for you. Here’s the form. Many thanks.